How are you lovelies today? Fabulous I hope to imagine. Today I have the perfect project for you to try, it's a great gathering place for all your memories and photos. I created this piece well over 2 years ago and am having the notion to make another one. Well this is my own version of a file folder or box (as in this case) of memories or rather in this particular file, books that I have enjoyed reading. 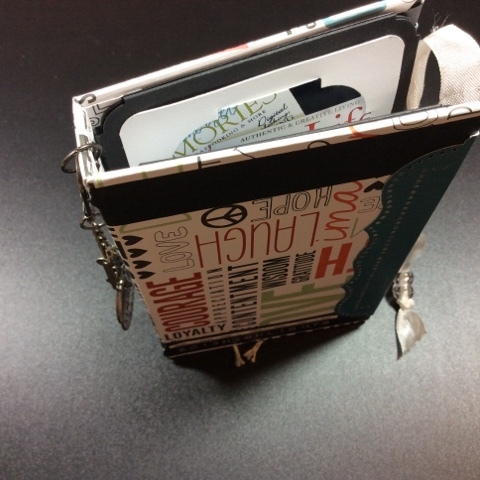 The way that I began this project is by using an older Sizzix library pocket die and cutting out 12 pockets. Once I had them all cut out I folded them up and glued all the sides to make my pockets, then I cut about 1/8 of an inch off the bottom of each pocket, which of course opened the end back up...this is where I will attach my binding. Next I pulled out a medium weight chip board and measured out what pieces I would need. I made sure of course that my files would sit easily and that they would have some breathing room between each one; once all the measurements were settled I went to cutting out all my pieces: the front cover and the back cover which were basically the same size, the bottom and the top which were the same size as well and then finally the front flap which had just about a two inch overlap on the cover. I covered all the pieces with some patterned paper that I had chosen beforehand. As for the files? I decided the best way to attach them is with a hidden hinge binding system that I learned from none other than the great Kathy Orta over on YouTube. If you haven't checked her out you should, she has some wonderful tutorials that you might be interested in. Anyways so that is how I attached my files and it worked great, my biggest challenge was getting the whole design to stand up properly which I suppose I finally figured out by accident. In order for that happy accident I decided to make an expandable box, so to create this I punched four holes, two on each side - one front and one back directly across from one another and finished each of them with an eyelet (more for appearance than performance) then I added a piece of elastic through the front and back hole, crimped a bead on the outside of each hole to hold the elastic in place then did the same on the opposite side, the key here was to get my elastic pieces the same length on each side which was harder than I thought it would be but the results were fantastic. To finish the file box itself I added a knob to the top panel and then on the front inside flap I added a Velcro dot so that the box would stay shut when not being used - this worked out great by the way because I think by making it remain closed it actually helps keep the balance and therefore standing up - see I told you that was a happy accident. Now what did I put in the files themselves? Well I used Google Images to find and save all the book jackets to the books I'd read. Once I had several of them copied I used my printer on the wallet print size (it puts 9 photos on a letter size page) then printed those onto regular cardstock, cut them all out and added them to the back of my homemade library index card. It turned out pretty cool actually and I have used this idea again and again when I am wanting to keep track of books I've read. This is the book jacket printed off and added onto the index card and below is the back of the index card where I used one of my stamps to create the look and give me the spot to document all the information. Now for me since I have the book jacket featured on the front I needn't worry to include the author or the title obviously but things I did include were the dates that I read it, my overall summary and then a final rating that isn't based on anything other than how I liked it. In the years since I've done this project the only thing I've changed is that I now print on Everyday Photo Paper instead of card stock for the simple reason that the glossy paper is a bit more like the actual book cover and I like that so much better. So here is a top view looking into my files and I'd dare say it is certainly time to make another of these I believe, especially considering the amount I've read since then. But until I make a new one I have come up with a couple of ways to keep track of all the books I've read: for one I still print out the book jacket and use my library index stamp, also recently I purchased a stamp set from Kelly Purkey that has become a favorite of mine when documenting books read but probably the most useful way for me, which I've used for a while now, is Goodreads. I can find pretty much anything and everything and it keeps it all on their website for me, including what I'm currently reading and where I'm at in that read, plus when I added it, when I started it and then when I finished it. It's a great tool for me since it's become important to me. Last year I did my first reading challenge through Goodreads and it kept me updated via email on my progress which was pretty cool but even better is when it told me I'd met my goal. Well there you have it, I hope that this inspires you to create or least of all maybe to read. I thank you for stopping in and spending a moment with me.